We’ve already discussed my love/hate relationship with cream cheese. We’ve also discussed my feelings on the use of boxed mixes. 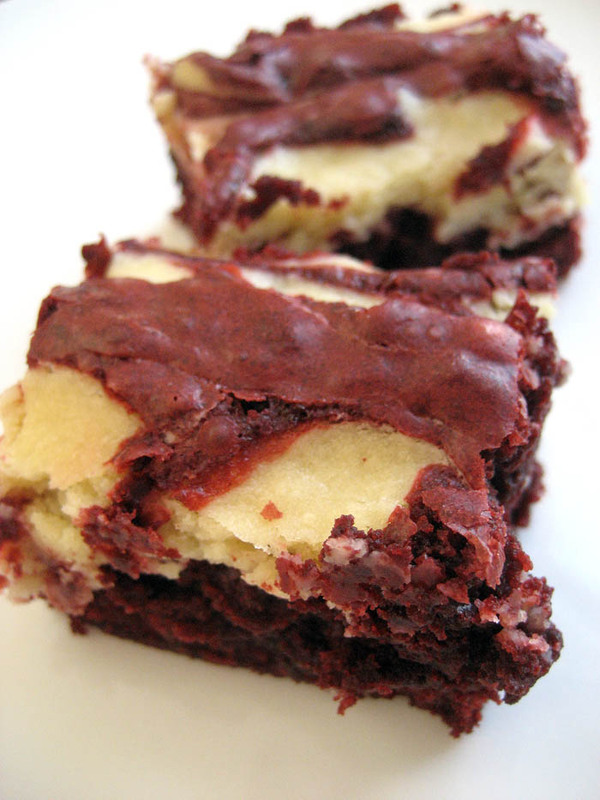 So, let’s skip the formalities and just declare that Red Velvet Cheesecake Brownies are delicious. And they are red, which makes them perfect for Valentine’s Day. And they’re super quick and easy, which makes them perfect for completion by tomorrow. For the longest time I thought all the recipes for “red velvet” this and that, that call for a full bottle of red food coloring were crazy. What good would that four-pack of food coloring be if there was no red? How would I be able to make pink, salmon, orange or melon? And surely a whole bottle would dilute the batter and make it runny. Thus, I never used a full bottle, only half. Shocker… my “red velvet” this and that was never all that red. Then, when I made these for the first time, I discovered I could purchase a solo bottle of red food coloring at the grocery store. I always knew I could do that with the gel colors, but apparently I was the last person to know you could do this with the generic water-based ones as well. 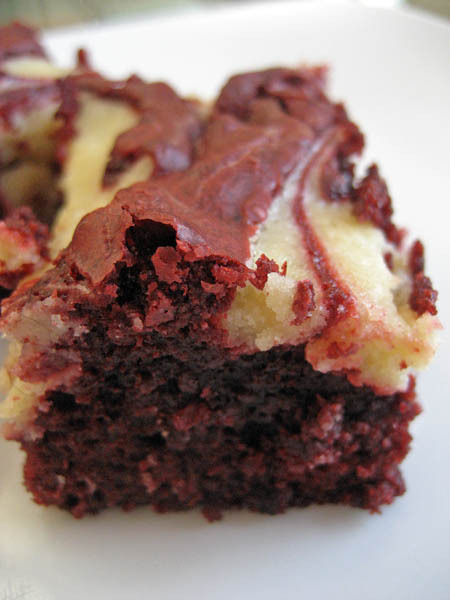 Since I was already making these with brownie mix, I figured ‘what the hell’ and went all in with the red food coloring. Heat oven to 350ºF (325ºF for dark or nonstick pan). Grease bottom only of 13×9-inch pan. In small bowl, beat cream cheese swirl layer ingredients with electric mixer on low speed until smooth. Set aside. 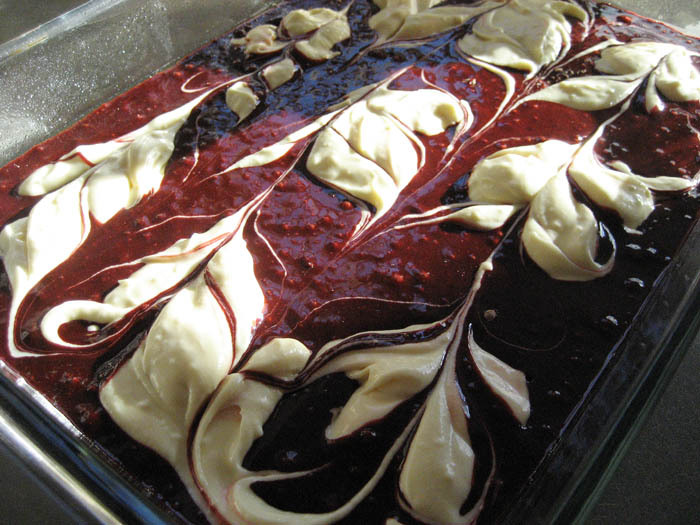 Make brownie batter as directed on box, using water, oil, eggs and adding espresso coffee powder and red food color; mix well until batter turns a rich red color. Spread batter in pan. Dollop cream cheese mixture by tablespoonfuls evenly on top of batter. With knife, cut through mixture a few times to marble. 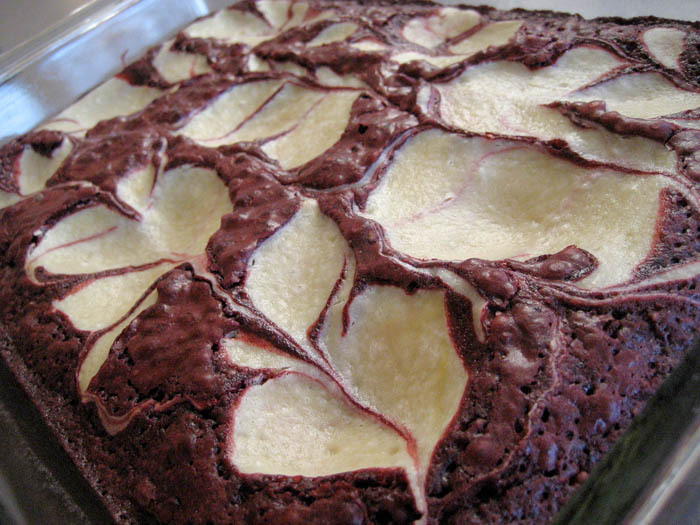 Bake as directed on brownie mix box or until toothpick inserted in center comes out almost clean. Cool completely, about 1 hour. Store in refrigerator.